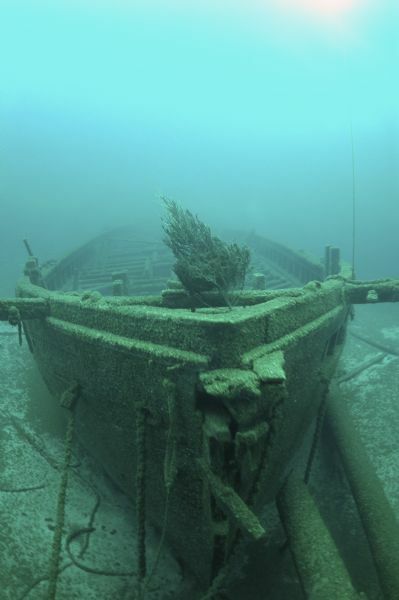 Underwater view of the bow of the Rouse Simmons with a Christmas tree placed on it. Local divers, every year (typically on the date the Rouse Simmons sank) place an evergreen tree on the bow of the ship. This image is issued by the Historic Preservation Division of the Wisconsin Historical Society. Use of the image requires written permission from the staff of the Division of Library-Archives. It may not be sold or redistributed, copied or distributed as a photograph, electronic file, or any other media. The image should not be significantly altered through conventional or electronic means. Images altered beyond standard cropping and resizing require further negotiation with a staff member. The user is responsible for all issues of copyright. Please Credit: Wisconsin Historical Society.